New $11.5 million theater breaks ground - Elizabethtown, Ky. This article was originally published in The News-Enterprise on Friday, December 16, 2016 at 11:52 a.m. 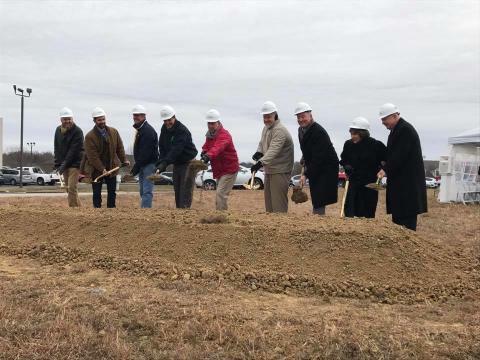 Ground was broken Friday morning on a state-of-the-art, nine-screen multiplex on Dolphin Drive in Elizabethtown. The $11.5 million multiplex is 42,000-square-feet and will feature a 62-foot screen among its nine screens. The Crowne Point Theatre site is at 2908 Dolphin Drive and is situated between the U.S Post Office and Crowne Pointe Business Center. “This is going to be a state-of-the-art theater and new experience for the people of Elizabethtown,” said Dr. Robert E. Robbins, an entrepreneur and investor in the project Friday. There also will be three 52-foot screens and five 40-foot screens. Included inside the theater will be game rooms, party rooms and a convenience store concept for concession buying. Robbins said the theater will serve as much Kentucky Proud products as possible, including popcorn grown locally from Highland Sod Farms in Elizabethtown. The multiplex is expected to open late next year. See Sunday&apos;s print edition of The News-Enterprise for more details.